The "peak" moment for allllll of that H2O to come down is coming up as fast as droplets fall over the side of a mountain. Springtime is "fall" time in Yosemite Valley, or at least the moment when waterfalls hit their peaks. WHEN AND WHERE THE FALLS... will do their fierce, rainbows-in-the-spray stuff. 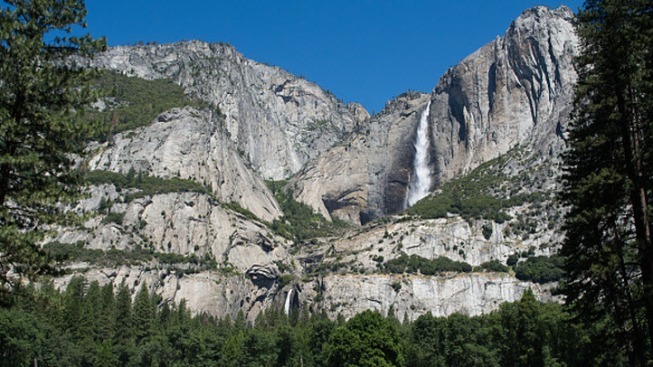 Sentinel Falls sees a start around March, per the National Park Service page, while Bridalveil Fall keeps it rocking throughout the calendar (though May is "peak"). Horsetail Fall is, you guessed it, a wintertime favorite, with a cold-weather run that hits its zenith with that late-February "fire" show at sunset. But numerous other water-droppers around the valley will be waterfalling their collective hearts out as May approaches, and even beyond. Know your falls? We know you do, but you can brush up here.